This issue can occur if your Active Directory runs on Windows Server 2008. 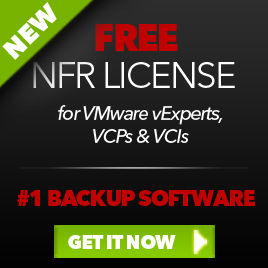 The Windows Server 2008 readonly domain controller (RODC) is not backward-compatible with Windows XP virtual machines. 3 Take a snapshot of the updated parent virtual machine. 4 Recompose the linked-clone desktops from the updated parent virtual machine and snapshot. This issue occurs when Windows XP desktops fail to join the Windows 2008 Active Directory domain. Ensure that the Windows XP Master is updated with the latest Microsoft patches. Ensure that the Windows Server 2008 read-only domain controller (RODC) compatibility pack for Windows Server 2003 and Windows XP clients is installed in the master virtual machine. For more information and to download the patch, see the Microsoft Knowledge Base article 944043. Note: The preceding link was correct as of January 28, 2011. 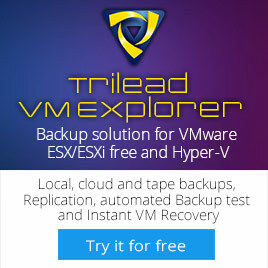 If you find the link is broken, provide feedback and a VMware employee will update the link. After applying the patch, create a new snapshot for use with linked clone pools or convert the virtual machine to a template for full clone or deployment using Sysprep. After applying the latest Windows XP updates and the patch mentioned above. I was able to deploy the XP desktop pool again. So if you are deploying View desktop with Windows XP in a Windows 2008 domain. Install the patch mentioned in KB944043. Note. I saw this issue only on desktops with the latest View 4.5 agent installed. The desktop pool with the View 4.0 agent did work as expected. This entry was posted in VMware and tagged Active Directory, View 4.5, Windows Server 2008 on February 9, 2011 by afokkema. In Windows Server 2008, this process is a lot easier and will costs you maybe 5 minutes of your time. Right click on the volume and click on Extend Volume. 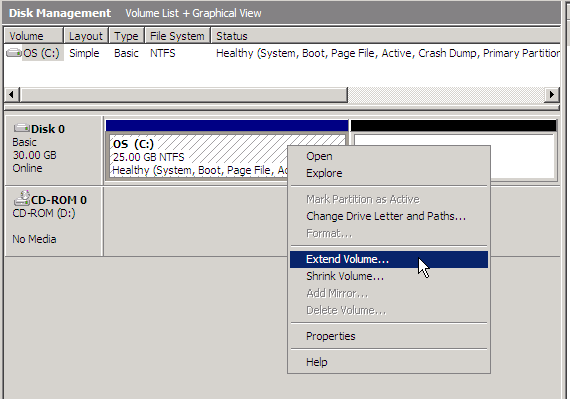 After a couple of seconds and a refresh in the Windows Explorer, the partition will have it’s new size. 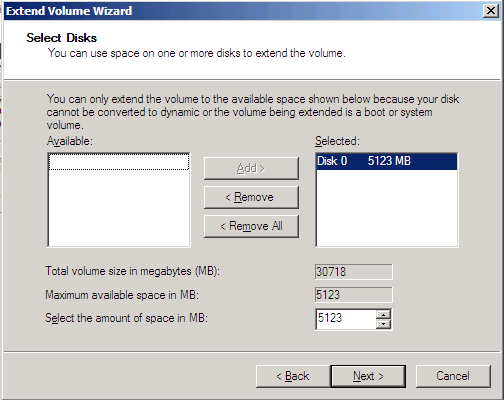 This entry was posted in VMware and tagged Extend, Partition, Windows Server 2008 on June 11, 2009 by afokkema. Transparent Data Encryption – Enable encryption of an entire database, data files, or log files, without the need for application changes. Benefits of this include: Search encrypted data using both range and fuzzy searches, search secure data from unauthorized users, and data encryption without any required changes in existing applications. Enhanced Database Mirroring – SQL Server 2008 builds on SQL Server 2005 by providing a more reliable platform that has enhanced database mirroring, including automatic page repair, improved performance, and enhanced supportability. Automatic Recovery of Data Pages – SQL Server 2008 enables the principal and mirror machines to transparently recover from 823/824 types of data page errors by requesting a fresh copy of the suspect page from the mirroring partner transparently to end users and applications. Hot Add CPU – Dynamically scale a database on demand by allowing CPU resources to be added to SQL Server 2008 on supported hardware platforms without forcing any downtime on applications. Note that SQL Server already supports the ability to add memory resources online. This entry was posted in Microsoft and tagged SQL, Windows Server 2008 on August 7, 2008 by afokkema.